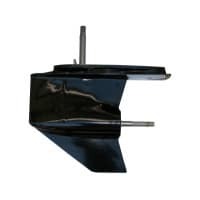 Top Marine sells your Mercruiser sterndrive complete or lower and upper sterndrives alpha One Generation 1, generation 2 and bravo one lower units. We have a Mercruiser sterndrive manuals. You will find; a full explanation of every product, all information for step by step maintenance and repair, plus a variety of detailled illustrations. All parts for your Mercruiser sterndrive have been tested for performance and endurance with all specifications. All parts are OEM compatible. We have the best current prices in Canada. uses rubber bushings, large washers and nuts to hold them on. The SE116 drive uses small plastic bushings, small washers and e-clips to hold them on. The next thing to look at is the water pump housing . The alpha One Generation 1 drive uses a plastic water pump housing . The alpha One Generation 2 uses a stainless steel housing. Also worth noting is the shift lever. alpha One Generation 1 drive does not have the “L” shaped lever whereas the alpha One Generation 2 drive does . You will also notice that the alpha One Generation 1 upper and lower are held together with studs and nuts and the alpha One Generation 2 is held together with bolts and nuts.